Britain’s largest ever mechanical puppet - created in the form of a giant Cornish miner - has been crawling his way along the county’s lanes and roads for the past fortnight, in celebration of the ‘Tinth’ anniversary of the Cornish mining landscape being designated a World Heritage Site. The towering metal ‘Man Engine’ has a real fire in his belly, a beating beam-engine in his heart and industrial revolution in his head. Accompanied by a dozen miners and bal-maidens who animate the giant throughout his travels, the procession includes live music and singing (with lots of crowd participation), theatrics and much, much more. Situated on the wildly beautiful Cape Cornwall coast, St Just is the most westerly town in Cornwall and grew around the mining industry. 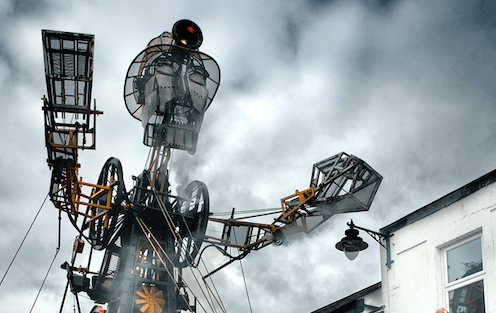 The Man Engine will be arriving at 11am and transforming into his impressive form before leaving for Botallack. After travelling the 130 long miles from Tavistock, the rumbling man-machine will journey to the edge of the county’s westernmost cliffs to rise up one last time - becoming a ten-metre tall Cornish miner at Geevor Tin Mine between 4pm and 6pm.